CBCT 3D imaging technology is far superior to conventional 2D dental imaging, as it enables practitioners to visualize all dental and facial structures in three dimensions and identify potential pathologic hard tissue lesions and other abnormalities. It also provides the most accurate diagnosis and treatment planning in general dentistry, periodontics, implant planning, oral maxillo-facial surgical cases, and orthodontics. It is crucial for your dentist to have the most accurate and complete information to properly plan your treatment. Unlike traditional x-rays, the Cone Beam CT image is a three dimensional computerized image that enables your dentist to very carefully and precisely diagnosis and plan your treatment. Safe and reliable 3-D cone beam imaging provides that information, with a host of additional advantages for both you and your dentist. Your scan only takes 18 seconds, it’s quick and painless! Facial Imaging Mobile will travel to your dentist’s office or your home or place of business. It’s our convenience and customer-first focus that simplifies what is otherwise a prolonged, time consuming, and open ended process. Imagine the convenience of having a CT scan performed in our state of the art mobile platform in your driveway! 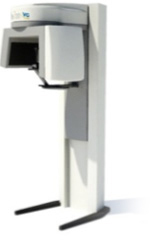 Cone Beam Computed Tomography (CBCT) scanners have been available for craniofacial three dimensional imaging in Europe since 1999 and introduced in the United States in 2001. The classical medical Computed Tomography, or CT scan, is well known through the characteristic tunnel-like machine. Medical CT scanners use an X-ray source that rotates around the body to make cross-sectional images. Computers stack up the resulting “slices” to create a unified, three dimensional image of a chest, heart, jaw or other body part. Medical CT scanners often produce many more times the dose of radiation to produce their images than do X-ray machines and CBCT. For instance, an abdominal or craniofacial scan can expose the site to 50 times the radiation that X-rays would. For dental applications, the medical CT scanner requires a separate scan of the mandible and of the maxilla which will result in very high levels of radiation. A Cone beam CT scanner can scan both jaws in total scan time of approximately 8.5-18 seconds with 3.6-6 seconds of actual exposure time depending on the manufacturer. This represents less radiation than one would receive with a full series of periapical radiographs. CBCT also differs from the medical CT scanner in that it does not image “slices.” Instead its cone shaped beam scans a complete volume of the craniofacial structures at once utilizing a narrow cone beam of radiation, and provides a volume of data in its field. With the subject in a sitting position, rotating the beam around the subject’s head making an image every few degrees, and subsequent reconstruction software applied on the volumetric data, both jaws and craniofacial areas of interest are observed. This results in real time 3-D images from every angle with high resolution, exacting and optimal detail. The compact size and low radiation dosage of the CBCT scanner, sitting position of the patient, and high level of accuracy of the 3-D images of the areas of interest, makes it ideally suited for imaging the craniofacial structures. The CBCT is reported to be accurate to approximately 0.1 mm while the medical CT scanners are accurate to approximately 0.5 mm. The CBCT is emerging as the imaging “standard of excellence” for diagnostic and treatment planning, and patient education, in all phases of dentistry. There are a multitude of dental indications for the use of CBCT maxillofacial imaging, including evaluation of the jaws and facial bones for infection, impactions, tumors, fractures, and developmental and congenital deformities; three dimensional assessments by the restorative dentist and surgeon of the quality and quantity of alveolar bone of one or both jaws for combined treatment planning for restorative driven virtual implant placement with optimal emergence profile, and identifying critical anatomical landmarks including the inferior alveolar canal, and maxillary sinus; visualization of the temporomandibular joint and its components, and condylar changes following orthognathic surgery; stability, predictability and three dimensional assessments of mandibular changes prior to and after orthognathic surgery; orthodontic 3D cephalometrics, and study of changes over time by comparative cephalometric overlays, surgical positioning of orthodontic mini-implants with guides fabricated on models replicated with cone-beam computed tomography; and airway analysis by assessment of lateral cephalometric diagnosis of adenoid hypertrophy and posterior upper airway obstruction. Cone Beam Computed Tomography: The New Generation of CT Scan In Dentistry. Cone Beam Computed Tomography (CBCT) scanners have been available for craniofacial three dimensional imaging in Europe since 1999 and introduced in the United States in 2001. CBCT can take both jaws in 3.6-6 seconds of actual exposure time depending on the manufacturer. This represents significantly less radiation than one would receive with a full series of digital periapical radiographs, and is relatively equivalent to bite wing radiographs. CBCT results in real time 3-D images from every angle with high resolution, exacting and optimal detail. The compact size and low radiation dosage of the CBCT scanner, sitting position of the patient, and high level of accuracy of the 3-D images of the areas of interest, makes it ideally suited for imaging the craniofacial structures. The CBCT is reported to be accurate to approximately 0.1 mm while the medical CT scanners are accurate to approximately 0.5 + mm. The CBCT is emerging as the imaging “standard of excellence” for diagnostic and treatment planning, and patient education, in all phases of dentistry. There are a multitude of dental indications for the use of CBCT maxillofacial imaging by the general practitioner and specialists, including evaluation of the jaws and facial bones for pathology, impactions, tumors, fractures, and developmental and congenital deformities. It is invaluable for three dimensional assessments by the restorative dentist and surgeon for combined treatment planning and use of stents. The goal is to jointly achieve restorative driven virtual implant placement with optimal emergence profile and occlusal harmony.